How you see the world is about to change. All That We Share is a wake–up call that will inspire you to see the world in a new way. As soon as you realize that some things belong to everyone—water, for instance, or the Internet or human knowledge—you become a commoner, part of a movement that’s reshaping how we will solve the problems facing us in the twenty-first century. 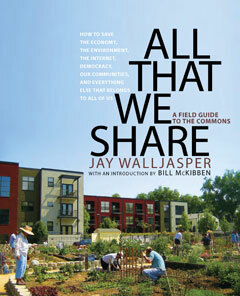 Edited by award-winning journalist Jay Walljasper, All That We Share is an indispensable introduction to fresh ideas that touch all of us. Filled with practical solutions for today’s economic, political, and cultural issues, it’s a much-needed and thoroughly accessible field guide to the new world of the commons. Including success stories from communities across the country and around the world, this book is for anyone seeking new ways of thinking about our shared values.